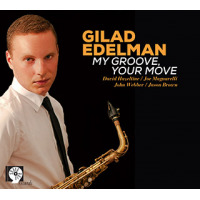 Gilad Edelman is the son of Marc Edelman, the brains and will behind Sharp Nine Records, a fiercely independent label which has produced some of the finest straight-ahead jazz records of the past fifteen years. Despite limited resources and operating in the midst of the industry's severe downturn, Sharp Nine has released impressive recordings by significant, well-traveled artists like pianists David Hazeltine and Tardo Hammer, tenor saxophonist Grant Stewart, alto saxophonist Ian Hendrickson-Smith, the bands Planet Jazz and One for All, and recently fostered the emerging talents of alto saxophonist Dmitry Baevsky and singer/pianist Champian Fulton. The nine tracks of My Groove, Your Move offer ample proof that familial considerations haven't impaired Marc's ability to judge talent. In short, the record is up to Sharp Nine's customary high standards. A smart, soulful alto saxophone stylist, Gilad is prepared to deal with some of New York's finest: Hazeltine, trumpeter Joe Magnarelli, bassist John Webber, and drummer Jason Brown. All in all, Groove doesn't come off as a showcase for an up-and- coming player; rather, it's a balanced, fully realized piece of work performed by individuals who have each other's best interests at heart. Gilad doesn't resemble the legions of cookie cutter saxophonists coming out of today's university jazz programs. Unlike most of his twenty-something peers, he sounds removed from the sanctuary of the practice room and fully immersed in making music in real time. Although he's indebted to Charlie Parker, Sonny Stitt, Julian "Cannonball" Adderley, and (perhaps) Johnny Hodges, these influences don't loom large in the overall scheme of things. On the soul-jazz tinged tracks "Sweet Honey Bee" and "My Grove, Your Move," Gilad finds ways of integrating vibrant, speech-like phrases and cutting bursts of bebop. A tone that gives equal weight to sustained notes and rapid fire passages goes a long way in making these transactions sound genuine. An appealingly relaxed qualityeven on the up tempo burner "Eye of Irene"speaks to a maturity well beyond his years, and is a refreshing change from the "the more notes the better" approach of many of his contemporaries. Equally important is Gilad's keen sense of time and ability to move confidently in the thick of the rhythm section's robust support. He doesn't flinch when Hazeltine tweaks him with a persistent, playful smattering of chords during "I Love You (verse)." In a disc full of strong, bracing tracks, the ballad medley of "For All We Know/We Kiss in a Shadow" stands out. One after the other, Gilad and Magnarelli offer exquisite interpretations of beautiful, timeless songs. Both of them deftly mix understated, viscerally compelling renditions of the tunes and brief flashes of improvisation. On one level, it's the kind of playing that will satisfy a discriminating jazz fan; on another, it's music to lose oneself in. Track Listing: Track #1: I Love You (verse); Track #2: On The Street Where You Live; Track #3: Foi a Saudade; Track #4: Eye of Irene; Track #5: Sweet Honey Bee; Track #6: For All We Know/We Kiss in a Shadow; Track #7: My Groove, Your Move; Track #8: The Way You Look Tonight; Track #9: The Lineup. Personnel: Gilad Edelman: Alto Saxophone; Joe Magnarelli: Trumpet/Flugelhorn; David Hazeltine: Piano; John Webber: Bass; Jason Brown: Drums.